The Pawtuckaway Mountains in New Hampshire are a small, rocky, circular range. They form the outline of an ancient volcanic ring dike, dating from 130—110 million years ago (Cretaceous era). More amazing geology in New Hampshire. A dike (or dyke) is a sheet of rock that is formed in a fracture in a pre-existing rock body. Dikes can be either magmatic or sedimentary in origin. Giant dikes typically exceed 30 m in width and 100 km in length, with some examples over 100 m wide and 1,000 km long. Dikes are self-induced magma-filled fractures, and they are the dominant mechanism by which basaltic melts are transported through the lithosphere and the crust. These spectacular intrusions are likely to have fed flood basalts in large igneous provinces (LIPs), including provinces where the surface basalts have been diminished or removed by erosion. Although giant dikes can intermingle with denser swarms of smaller dikes of similar composition (and probably similar origin), others occur in sets of several to a few dozen extremely large quasi-linear or co-linear intrusions, which may gently bend and converge/diverge at low angles across many degrees of latitude. Tectonic controls on the formation of giant dikes appear to be independent and different from structures related to smaller dike swarms. Theoretical modeling and field observations help us to understand the essential physics of magma migration from its source to its final destination in the upper lithosphere. 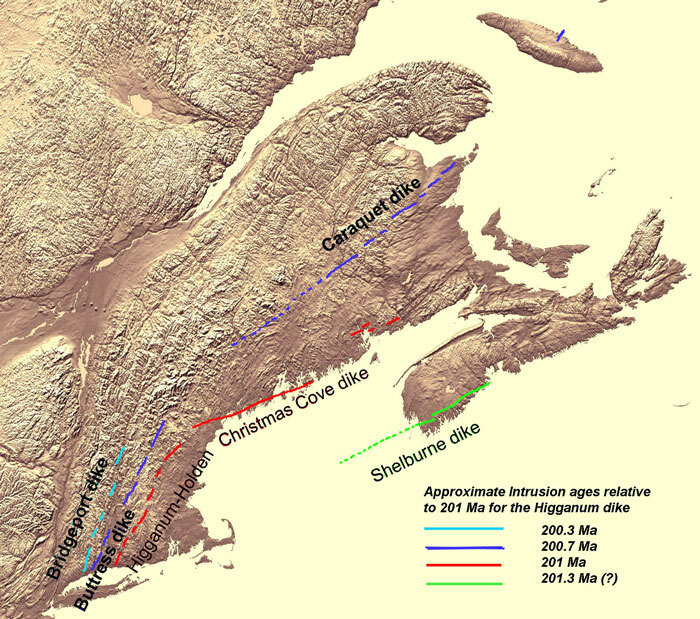 …in northeastern North America, huge but widespread dikes in Canada and New England diverge to the NE and ENE from a focus point east of New Jersey, but that is also not a plume center. The dikes change their trends across the “New England Salient,” which is a bend in terrane suture zones and primary structures of this section of the Appalachian Orogen. In addition, the giant dikes did not form together in a radial generation, but instead decrease systematically in age from the SE toward the NW (Figure 6). The Appalachian Mountains first formed roughly 480 million years ago during the Ordovician Period. They once reached elevations similar to those of the Alps and the Rocky Mountains, before naturally occurring erosion. Definitions vary on the precise boundaries of the Appalachians. The United States Geological Survey (USGS) defines the Appalachian Highlands physiographic division as consisting of thirteen provinces. However, some definitions don’t include the Adirondack Mountains, which geologically belong to the Grenville Orogeny and have a different geological history from the rest of the Appalachians. 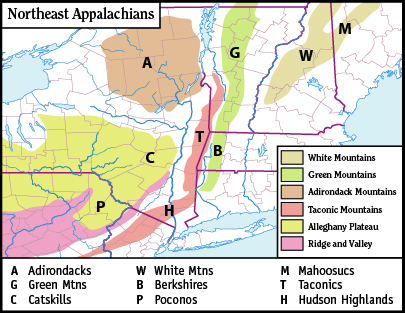 Map of the Appalachian Mountain physiographic regions, highlighting the Great Appalachian Valley, naming the main valleys making it up and the main mountains on either side. The Appalachians here in the northeast. The Appalachians are a complex mix of mountains formed by a series of continental collisions that took place over a period of more than 1 billion years. This page focuses on important mountain-building and landscape altering milestones in the history of the Northern Appalachians and New England. It utilizes a set of illustrative cross sections to depict the cumulative effects of these milestone events. The example cross-section runs parallel to, but slightly north of the present southern coasts of Connecticut, Rhode Island and Massachusetts, and extends westward into New York state and eastward beyond Cape Cod. Each geological event mentioned on this page is described more fully on other pages on this site; and those pages, in turn, have links to external resources. Each of these mountain building events (orogenies) included incorporation of new land masses seaward of the former coast line, distortion of existing land forms and metamorphosis of existing rocks. Erosion of the each newly-formed mountain chain resulted in deposition of massive amounts of sediment – both inland and along the coast. Over the more recent past (tens of thousands of years) the region has been further shaped by two major glacial advance and retreat cycles. Researchers at Rutgers University and Yale University have used an array of seismic sensors to reveal what is happening beneath New England… geologists use seismic vibrations caused by earthquakes to visualize the features within rock. Sensing how fast seismic ripples move, for instance, provides details about the structure and temperature of Earth’s mantle. Levin’s team studied data from EarthScope, a National Science Foundation program that deploys hundreds of geophysical instruments across the United States. The project’s Transportable Array, a temporary network of seismic sensors, made its way around the country starting in 2007. The array picked up readings from small earthquakes and observed the motions of seismic waves in various regions. The team piggybacked off previous research showing a relatively hot spot beneath New England’s upper mantle. Using data from EarthScope, they then observed a localized plume of warm rock beneath central Vermont, western New Hampshire, and western Massachusetts—and found geologic evidence that it’s on the move…. In this figure, strength of mantle flow is shown along with the colored map of seismic wave speed at 195 kilometers (121 miles) beneath the Earth’s surface. The warm colors indicate lower speed, implying that rock in those regions is less dense, likely warmer and rising toward the surface. The key finding is that mantle flow indicators are smallest above the warm region, likely because warmer rock flows upward and disrupts the horizontal flow.